Jokhang Temple Will Be Reopen to Public after Fire Here is the latest update from Tibet Tourism Bureau, Lhasa, Capital city of Tibet. After the previous fire hitting Jokhang Temple on Feb.17,2018, Jokhang Temple attracts worldwide travelers attention. Due to the inconvenience, Jokhang Temple temporally closed its door to visitors. But on Feb.20, all Tibet travel agencies here in Lhasa received positive news which says that Jokhang Temple has a rest day on Feb.20, but it will be reopen to public between 10:00 am and 16:00 pm. If there is further update about Jokhang Temple sightseeing, we will keep updating. 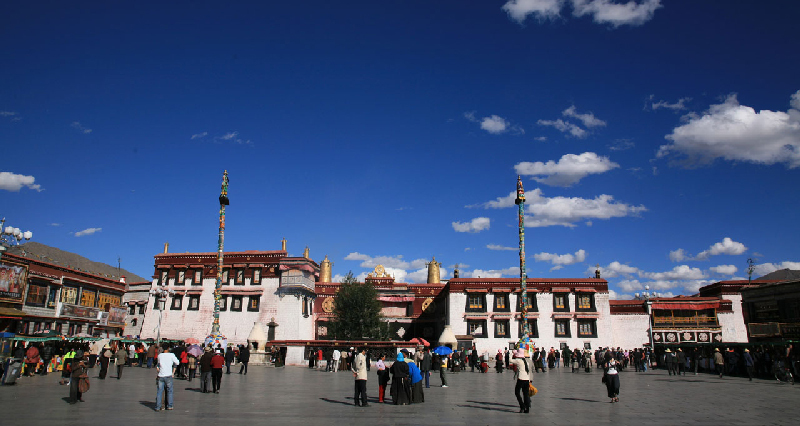 Jokhang Temple is known as one of the most sacred and important sites in whole Tibet. Everyday, Tibetan Buddhist pilgrims prostrate themselves in front of the holy temple. A visit to Lhasa without visiting Jokhang Temple is not complete. Sitting in the heart of Lhasa ancient downtown, Jokhang Temple is on the UNESCO's World Heritage list in 2000 as part of the Potala Palace. With an area covering 25,100 square meters (about six acres), it is the ultimate pilgrimage destination for Tibetan Pilgrims. Jokhang Temple History As the most sacred temple in Tibet, Jokhang Temple is in the center of Lhasa city and attracts many pilgrims to worship and circumambulating around. The temple was founded during King Songtsen Gampo’ reign (617-650 AD). At that time, the King built the temple to welcome his two brides, Princess Bhrikuti from Nepal and Princess Wencheng from China in Tang Dynasty. Both princesses brought statues of Jowo Sakyamuni as their dowries, therefore, Songtsen decided to build a temple to house these important statues. Together with Jokhang Temple, Ramoche Temple was built as well to place the statue brought by Princess Wencheng. Later, the statue was moved to Jokhang Temple as well for better protection.